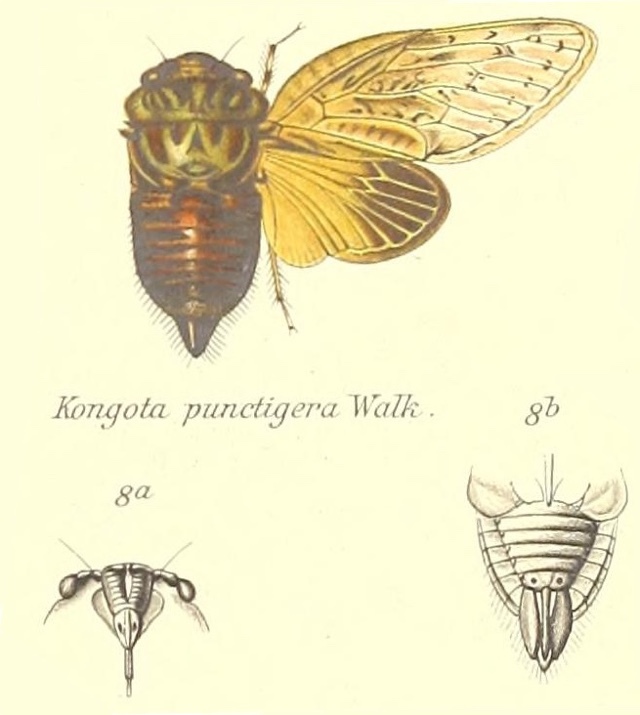 Kongota punctigera (Walker, 1850). Found in south-east Africa, specifically the nation of South Africa. Remarkable wing shape! Characters. — Head (including eyes) about as wide as base of mesonotum, anteriorly subtruncate, deflected in front of eyes ; pronotum transverse, its posterior margin about half the length of its vertex, the lateral margins ampliately and subangulately produced, their apices extending to about the base of basal cell of tegmina; mesonotum about as long as pronotum; anterior femora basally and subapically tuberculously spinous; posterior tibiae with a few spines on apical area; metasternum elevated and centrally sulcate; tympanal coverings moderate in size; opercula short and broad, their apices more or less convexly rounded; rostrum reaching the posterior coxae; tegmina with the costal membrane much arched at base and dilated, broader than the costal area, basal cell very broad; ulnar veins widely separated at their bases.